In December of 1870, John H. Surratt gave his first public lecture about his involvement with John Wilkes Booth and the plot to kidnap Abraham Lincoln. His hope was to turn his notoriety into a successful career as a lecturer. He gave speeches in Rockville, MD, New York, Baltimore and was scheduled to speak in Washington, D.C. when public outcry and his arrest put an end to dream vocation. In truth, his lecture did not provide any earth shattering revelations and the full text of his Rockville lecture can be read on Roger Norton’s Lincoln Assassination Research Site here. 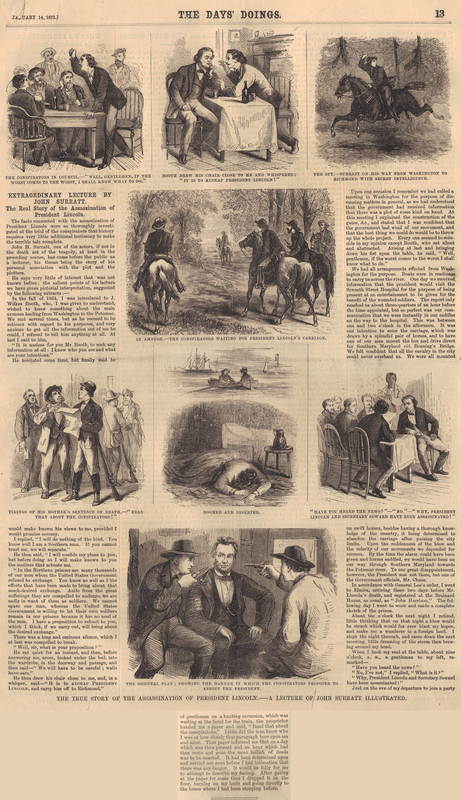 Publishing the words of John Surratt, an accomplice of the assassin, clearly fit the newspaper’s modus operandi. However, they found Surratt’s lecture too tame and lacking of drama. “He says very little of interest that was not known before,” the newspaper stated and, therefore, they supplemented the text by including several engravings: “The salient points of his lecture we have given pictorial interpretation”. This is wonderful, Dave! Congrats on owning this wonderful old “Penny Dreadful” Paper. Love the graphics – they are priceless!